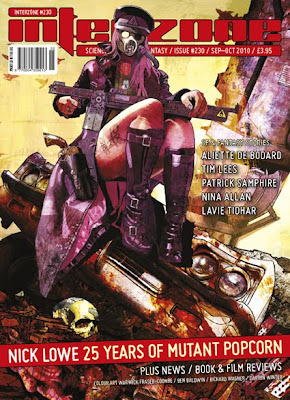 The latest issue of Interzone celebrates 25 years of Nick Lowe’s film review column ‘Mutant Popcorn’ with a reprint of the very first column, and an interview with the man himself. It’s an impressive feat for any genre magazine to have reached the stage of being able to celebrate a quarter century in its existence. Of course to go with this feature there is the usual fair-sized selection of book, film and DVD reviews, plus five stories.